Scientists can't specify the time, in which dog arise as a mammal species. It's hard to imagine those ages, even acccording to the skelet remains, but we know, that the process of domestication of the dog begun 10.000 years ago. The origin of The Leonberger race is dated to 1846, we know it exactly. Leonberger dog was the result of the effort of dog - fancier Heinrich Essing from Leonberg. Leonberg is situated by Stuttgart in Germany. He was full - time fancier, because he took care of many animals in his home. The idea was to create the dog, who looks like a lion and is friendly and suitable for guarding. 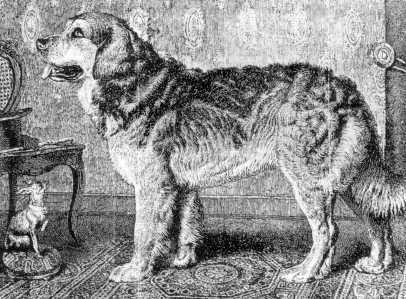 Leonbererger dog was created by intersecting Saint Bernard's dog, Newfoundland dog and Pyrenees shepherd's dog. The empress Elisabeth enrich her pack by the Leonberger dog in 1870. She bought the dog for the price of 1400 gold coins, which was really big amount. 374 dogs were exported approx. in 1873. Aristocrats were the most common buyers of the Leonberger dog both in Europe and Germany, the land of their origin. Heinrich Essing died in 1889. This event negatively influenced the breeding of the Leonberger dog. The opponents tried to annihilate the race, but they weren't succesfull. Owners and fans united in 1895 and founded "The international club for the Leonberger Dogs" in Stuttgart. "National Leonberger club" in Apolda and "Leonberger club" in Heidelberg followed in 1901 and 1908. All breeding was badly influenced by both word wars. Volunteers struggled for the restoration of Leonberger dog breeding after 1945. On 10th June 1948 "German club for the Leonberger dogs" was founded. This club, which seat is in Leonberg, represents this race from 1948 till today. The club is the highest authority for leonbereger's breeding, which associate number of registered clubs from east and west Germany. Club administrate main breeding book and is a member of german kynologic association ( VDH ), member of FCI and preside at International union of Leonberger fanciers. Czech club of Leonberger fanciers, which ranged Bohemia and Moravia, is a member of the union from 1992. Leonberger dog is breeded in majority of European countries as well as in the U.S.A. Great power in breeding is Germany, where several hundreds of dogs are registered each year. Leonberger dog couldn't became a popular race, but we can indicate, that he attract many fanciers. He's very strong, impressive and elegant dog, which attract wide surroundings. His nature is well - ballanced. Dog is quiet, self confident and temperament together. He's could be well mastered and trained, he's an ideal friend for whole family. Perfect guard and family dog together. Leonberger belongs to long - hair races, but not every dog we can sort to long - haires for first look. Czech breeding is based on used to be "NDR" breedings. Import from west Germany has beeen possile from 1990, that's why we can found dogs of two main types in our country. First type is from east Germany. Dog is huge, heavy. His hair is rather shorter. His head is more broad. West Germany type has lighter skelet and longer hair. Cross breeding of those types helps to eliminate problems with relationship breeding, especially dysplasis of hip joints. Cross breeded dogs have a better hair too. Leonberger is a dog for everyone, who wants to have beautiful, unusual and all - round animal, which brings by it's nature and look joy and fun to all family. Leonberger dog must be a number one dog for all, who wants and who are able to assure good living conditions for him.